Died, as we died, and see there is no more. It is particularly sad that these great men and women, some of whom had survived the terrible conditions and slaughter on the battlefield, were to die in Sutton Veny of sickness on their way home. If you live in or near Sutton Veny, why not print out the details of a soldier below, go and visit their grave and leave a flower so they are remembered, valued and loved despite being far from home. The Cemetery as bodies were interred in 1918 and as it is today. Note the same large headstones in both pictures. Anderson Albert James Anderson was born in October, 1900 in Balmain, an inner Sydney suburb of New South Wales to Elizabeth and James Duncan Anderson. He initially enlisted in 1915 at only 15 years of age but a letter from his mother soon resulted in his discharge for being under age. This wasn't going to stop him enlisting, however, because a few months later, he enlisted again, this time under the name, James Hegarty (his mother's maiden name) and stated his age as 19 years and 2 months. 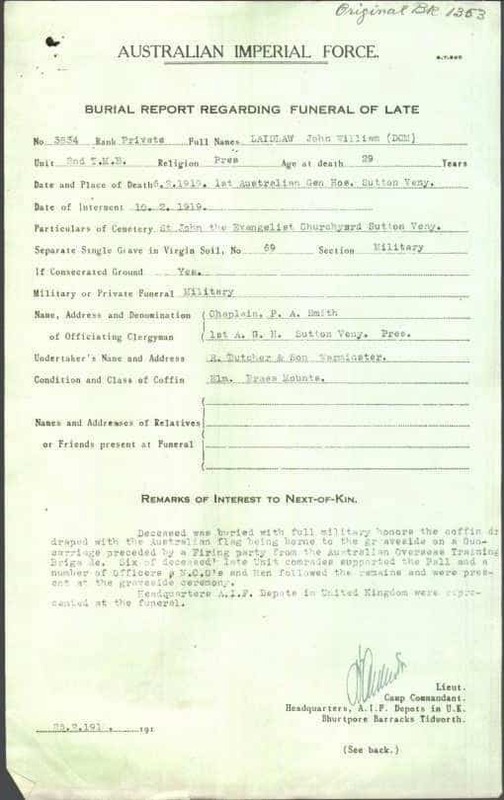 His enlistment papers include the note that he was to be employed as a bugler. Unfortunately, it seems that he became unwell before he even left Australia, requiring hospitalisation twice during his training in WA for diarrhoea and then influenza. This Australian boy who had probably never seen snow before, found himself on a sea voyage into one of the northern hemisphere's worst winters, and living and training in barracks in the much colder English climate. Sadly, he never got the chance to see active service because he was hospitalised twice at the Sutton Veny Military Hospital for acute bronchitis from which he never recovered. When he died on 22 February 1917, he was only 16 years and 4 months. 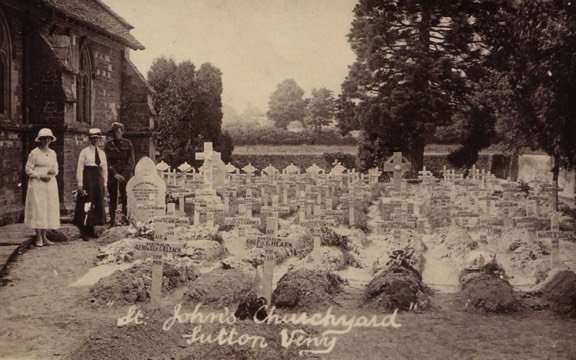 Albert James Anderson (served as James Hegarty) was buried in Plot 285, Row C, grave number 10 in the cemetery of St John The Evangelist Church at Sutton Veny, Wiltshire, England. Andrews He was the son of William and Mary Anne Andrews, husband of Annie Andrews, born in Sydney in 1883 he was aged 35 when he died. He was stationed on Salisbury Plain in 1918 awaiting transfer to Germany, when he became a victim of the Flu epidemic in 1918 and died of pneumonia. He was a member of the Australian Infantry 2nd Battalion and had enlisted in 1916. His grave is no.368 B. E 22 Buried St John Church Sutton Veny. Best V More information is here. Borgmeyer A J More information is here. Cameron M W. Private Murdoch William Cameron SX 2304. Born 2.2.1894 on Witera Station near the township of Talia in South Australia Occupation prior to enlisting was a Farrier He enlisted in Adelaide 17.8.1915 Aged 21. Joined the 32nd Battalion Left Australia on the boat "Anchises" on 30.3.1916. During the 3 years he fought in France where he was wounded 3 times. He suffered Influenza twice. Contracted Pleurisy which claimed his life 7.4.1919 Aged 25. Died at the Sutton Veny Army Hospital. 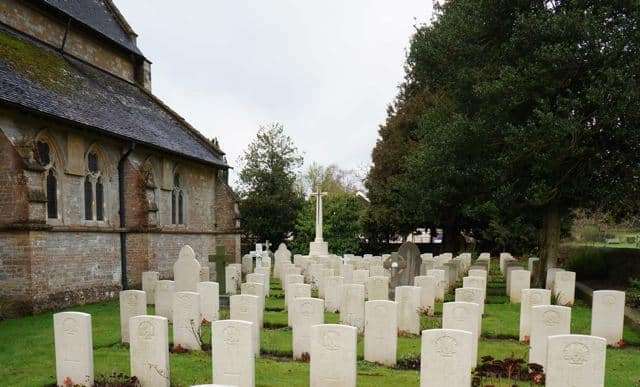 Buried with full army honours at the Sutton Veny Churchyard 9.4.1919. Received the British War Medal and the Victory Medal. A link to more information is here. Collis Francis Joseph (1892-1918) and his younger brother Albert Edward Collis (1894-1917) of Brighton in Tasmania; enlisted in 12th Bn Australian Inf. on the same day and sailed together on board the Ulysses to Plymouth in 1916. 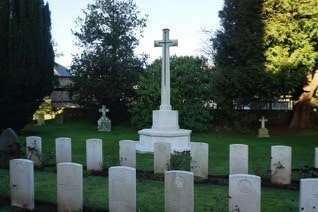 Francis died aged 25 at Sutton Veny Hospital on 23 March 1918 of generalised tuberculosis after being first wounded and then returned to hospital with 'trench fever'; his brother Albert died of wounds on 21 September 1917 aged 22 and is buried at Lijssenthoek Military Cemetery in Belgium. They were the middle sons of Nicholas & Mary Jane Collis of Brighton Junction, Tasmania. Lest we forget! Degidan. Brothers - Dvr 31524 Patrick Degidan (3rd Division Ammunition Column) and Dvr 31523 Michael Degidan (13th Field Ambulance Brigade) enlisted on the same day at Yorketown, South Australia. After active service on the Western Front, Michael Degidan returned safely to Australia in March 1919. Not so his brother, Patrick Degidan died of tuberculosis at Sutton Veny, January 13th 1918, aged 28. Durkin. He was murdered in Sutton Veny and the account of the investigation is here. Ellery W H More information is here. Jago A L More information is here. Laidlaw JW DCM. He was attested at the age of 25 years in Australia and joined 2nd Light Trench Mortar Battery. His citation reads - For conspicuous gallantry and dedication to duty during the operations East of Ypres on 4 - 8/10/17. His NCO having become a casualty he took charge of the team carrying carrying the NCO's load as well as his own. He was wounded in the shoulder but continued to advance. Later he was shot through the leg and refused to give up his load until he fell exhausted. He set a splendid example of courage and grit. Later in the campaign he received gun shot wounds to the face. On return to Sutton Veny at the end of the war he became ill with bronchial pneumonia in late Jan 1919 and died approximately 10 days later. He was buried with full military honours in the cemetery at Sutton Veny. His burial report is here. Lewis H More information is here. McPherson A C Angus Cameron McPherson born 16th March 1886 at Manly, Sydney. NSW. Australia. Son of John McPherson and Jeanie Fulton both from Glasgow, Scotland. Angus married Olive May Walker on 1st March 1913. They had four children Angus, Olive, Mary and Ruby. He enlisted 22nd April 1918 at the age of 32 years. Service Number 54233 in the AIF. Departing Sydney 19th June 1918. Angus died 11th October 1918 at Sutton Veny Miltary Hospital on leave with the dreaded flu. He was buried in St Johns Church Yard, Sutton Veny. Leaving behind in Australia, a wife and four children under four years. Compiled by Olives Daughter. Granddaughter of Angus Cameron McPherson. See here Sutton Veny Individual Stories. Maloney D G More information is here. Morris T F Thomas Frederick Morris was born around 1888 in Bundaberg, North Queensland. He was the 2nd child of Thomas Hodson Morris and his wife Fanny nee Hales. He was a gunner in the 3rd Australian Field Artillery and he enlisted in Bundaberg where he had been employed as a grazier. He sailed to Marseilles and travelled to the front by train. At some point he was wounded and spent time at a hospital in Norwich then returned to France. He was gassed and then sent to Sutton Veny to convalesce. Parker R S More information is here. Pittard C H More information is here. Rosenthal C H R More information is here. Sowton F L More information is here. Tyson F I C More information is here. Walker J M Jean was born in Tasmania, Australia on 16 Nov 1878 and died on 20 Oct 1918. She was the matron of the Sutton Veny Hospital. More details on her life and her funeral in Sutton Veny is here. Webber G, MM. Citation for the Military Medal. "For conspicuous bravery and endurance at ZONNEBEKE on 18th of October 1917 during heavy enemy barrage and counter attack, he went out into No Man's Land several times and bandaged and carried wounded men back to our lines, thus saving many of his comrades. His coolness and courage was most marked and he was an example to all." Sadly he was killed by a bus in Sutton Veny 10th November 1918 aged 29. More details are here.